Boar’s Head Brand, one of the nation’s leading providers of premium delicatessen products, partnered with Serious Eats website to survey how and why Americans choose their food. The results were clear: trust isn’t only a huge factor in the health of the relationships we have with each other, but also plays a significant role in the food choices we make. While PB&J may seem as patriotic as apple pie, Americans put their trust in turkey (44 percent) as their go-to sandwich over PB&J (7 percent). Bag lunches are easy on the budget, but what matters most to parents is what their kids are eating at school: 62 percent of parents pack their kids’ lunches to ensure they have healthy options. Forty-eight percent don’t trust the quality of what they’d get at school. “When Boar’s Head came to us to do this survey, we recognized an opportunity to better understand the motivations our readers have in making their decisions, every day, morning, noon and night,” said Jamie Feldmar, National Managing Editor for Serious Eats. BFFs (Best For Foodies) - When it comes to trusted food recommendations, friends (74 percent) trump family (68.5 percent). Cannot beat quality - Nearly 42 percent of respondents say they don’t trust brands that don’t have quality products. No compromises here - When it comes to food, most respondents are not willing to compromise on foods that have fillers and additives (60.6 percent) or foods that do not offer any nutritional value (53.3 percent). To ensure they have a healthy lunch (62 percent). 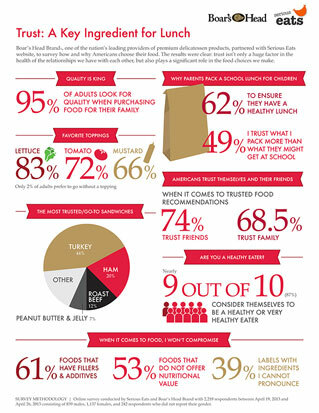 They trust what they pack more than what their child may get at school (48 percent). The top things people look for when purchasing food for their families are quality (94 percent) and nutrition (84 percent). Quality (96 percent) and nutrition (80 percent) were the top considerations for people purchasing food for themselves as well. Trust = Turkey - When asked what sandwich they trusted most/go-to sandwich, 44 percent of respondents named turkey as number-one. Ham was a distant second at 20 percent. Surprisingly, despite its iconic status, PB&J was hardly even in the race, with only 7 percent of respondents naming it as their trusted most/go-to sandwich. Topping the toppings list - Lettuce (83.2 percent), tomato (71.7 percent), and mustard (65.7 percent) top the toppings list. Put some crunch in your lunch - Surprisingly, rather than eating them on the side, 14 percent of respondents say they put chips on their sandwiches. During the month of May, Boar’s Head is asking fans to tell why they trust Boar’s Head through a Facebook contest for a chance to win prizes. The contest runs through June 2. For complete rules and to enter, visit facebook.com/boarshead. For more information about Boar’s Head, please visit: boarshead.com. Serious Eats is dedicated to the celebration of food—of all kinds. From fast food to fine dining, from restaurant kitchens to yours, and from coast to coast (and around the world). From each of our writers and through our online community, we aim to be passionate, discerning, and inclusive in our appreciation of everything edible. Serious Eats is an award winning food destination devoted to bringing our national community of food lovers the most delicious content on the web. The Serious Eats community has become an established and passionate community of food and spirit enthusiasts who trust our contributors to highlight the best in dining in and eating out. Online survey conducted by Serious Eats and Boar’s Head Brand with 2,218 respondents between April 19, 2013 and April 26, 2013 consisting of 839 males, 1,137 females, and 242 respondents who did not report their gender.